What Slack Triggers and Actions are Supported? 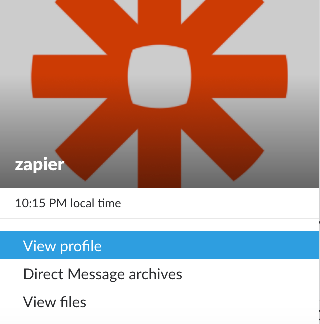 New Pushed Message - Triggers when you click the "Push to Zapier" button from a message in Slack. New Mention - Triggers when a username or highlight word is mentioned in a public #channel. New User - Triggers when a new Slack user is created / first joins your org. New File - Triggers when a new file is uploaded to your workspace. New Team Custom Emoji - Triggers when a custom emoji has been added to a team. New Reaction Added - Triggers when a reaction (aka reactji) is added to a message in a public #channel. New Starred Message - Triggers when you star a message. New Message Posted to Channel - Triggers when a new message is posted to a specific #channel you choose. New Public Message Posted Anywhere - Triggers when a new message is posted to any public channel. New Message Posted to Private Channel - Triggers when a new message is posted to a specific #private-channel or multi-dm. New Channel - Triggers whenever a new #channel is created. Set Channel Topic - Sets the topic on a selected channel. Invite New User - Invite a new User to your Slack workspace. Uses legacy tokens. Send Direct Message - Send a direct message to a user or yourself from the Slackbot. Send Channel Message - Post a new message to a specific #channel you choose. Set Status - Sets your Slack status to the given text and emoji. Add Reminder - Adds a reminder for yourself or a teammate, just like the /remind slash command. Invite User To Channel - Invite an existing User to an existing Channel. You must be a member of the channel to invite someone to it. Send Private Channel Message - Post a new message to a private channel you choose. Create Channel - Creates a new channel. Find User by ID - Finds a user by their ID. Find Message - Finds a Slack message using the Slack Search feature. Find User by Email - Finds a user by matching against their email instead of their username. Find User by Username - Finds a user by their username. Find User by Name - Finds a user by matching against their real name instead of their username. 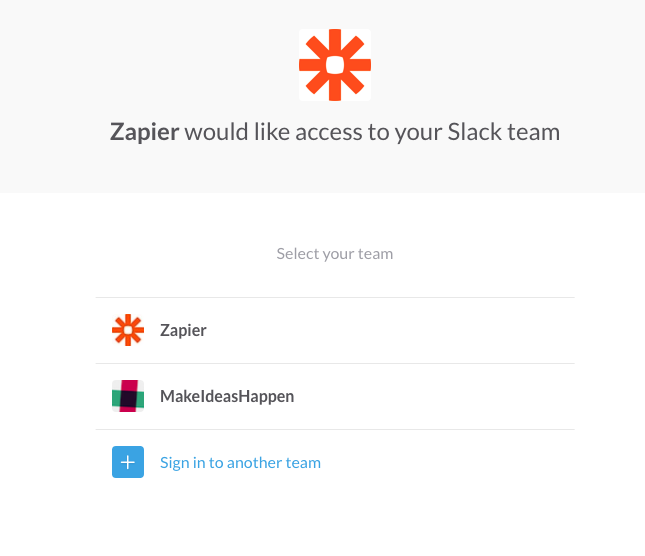 You'll then be asked to authorize the connection between Slack and Zapier. 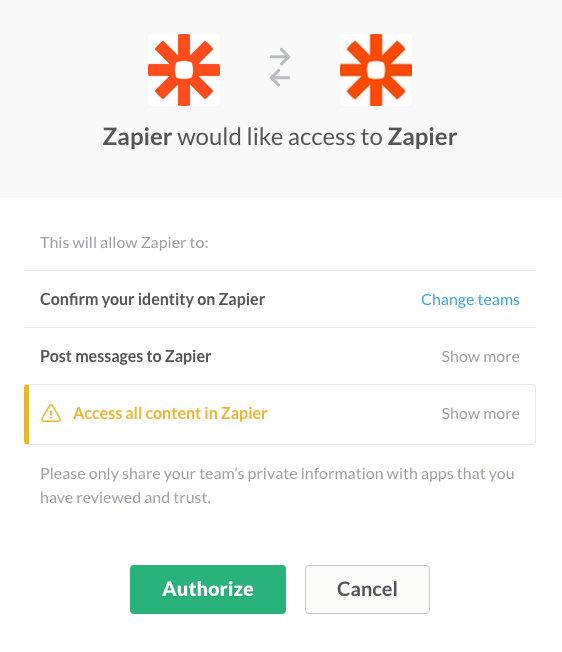 After authorizing, you'll get sent back to Zapier where you now have your Slack account connected! To format your message's text with styling (such as bold, italic, block quotes, code blocks and lists) you'll simply need to enter these in the same way you would do on Slack. You can read more on formatting the text on messages on Slack's formatting help guide here. 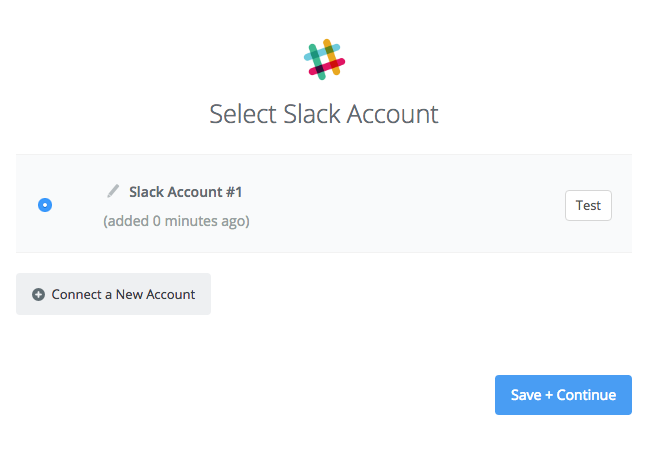 Slack will recognise normal links and make sure they're clickable on your post. This is just a basic overview of what is possible. 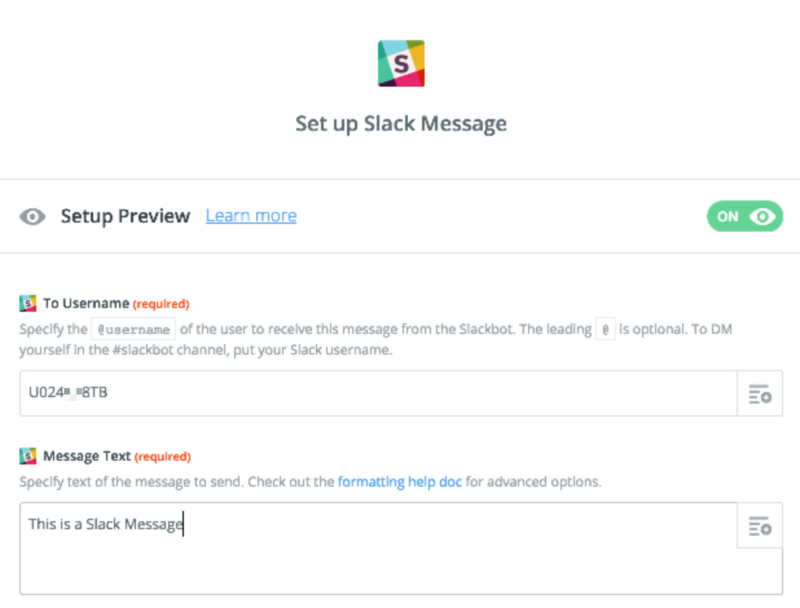 For more detailed information on formatting your Slack's messages, you can refer to their formatting guide here. Please don't hesitate to drop us a message if you get stuck or need a hand at all. Note: We are currently only able to trigger on non-ephemeral attachments, which appear to all users in a #channel or IM (rather than being visible to only you). A lot of messages with these attachments come from bots, so in order to see and trigger on those, make sure you select "yes" on the "Trigger on Bot Messages?" field. 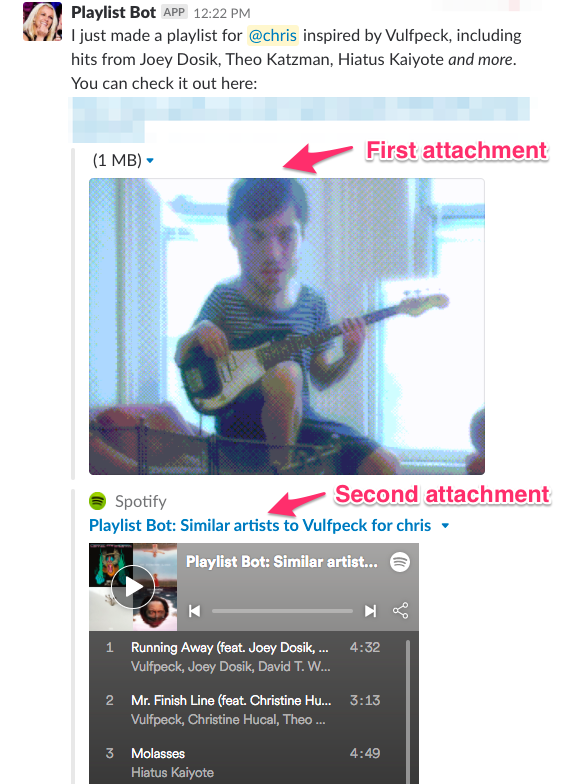 If your bot doesn't post any text with the attachment, the first attachment's text will become that message's text. We'll include attachment details in the response as well. Note: This feature is only available for trigger steps, not actions. If you'd like to send in a feature request for this to be added - contact us and let us know! Since message attachments aren't always going to be there, you'll probably want to limit your trigger to fire on certain user/bot names or channels. If you want to limit your trigger to a certain channel, use the "New Message in Channel" trigger and select your desired channel. To trigger off this, I set up my Trigger with "New Message Posted to Channel" and select your desired channel. Before you pull in samples, make sure the kind of post you're looking to trigger on is the most recent in the channel, otherwise you won't be able to grab that data. In late 2017 Slack started phasing out usernames and started using a numerical ID for users instead. This means that when using @user in configuring a Slack Zap, some handles/usernames would work, while others won't. 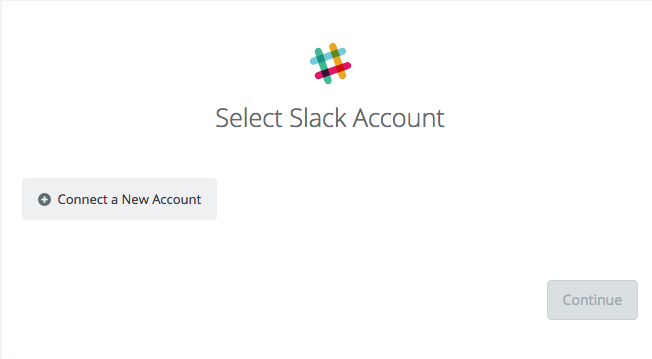 Each Slack user now has a Slack User ID to identify it. Using this User ID would ensure that your Zap configuration doesn't run into issues. Click "copy member ID" to put their ID on your clipboard. If you're trying to configure a Slack Send Direct Message step to that user, paste the ID straight into the 'To Username' field, without any brackets, etc. Normally these are messages sent by bots, slash commands, or other Slack integrations. Unfortunately, none of our triggers are currently able to trigger on content in message attachments. Right now it is not possible to send direct messages to one user, from another user. Direct Messages will always be sent to the recipient via their Slackbot direct message. There are no special actions needed to send messages as yourself. 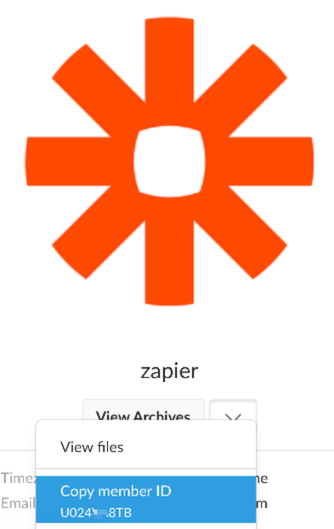 If you're seeing errors, please write in at contact@zapier.com. 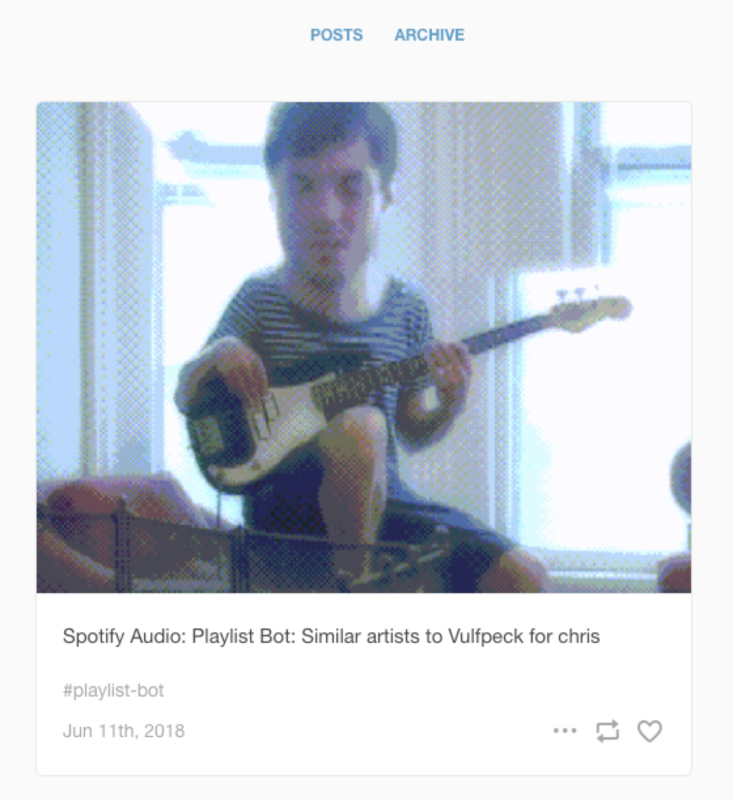 Unfortunately, it's not possible to post slash commands to Slack via their API, so if you send /giphy cute cats it'll just show up with that text. If you'd like to use Zapier to build a slash command, check out this helpful guide. If you see this error, it means that your team's free Slack account is at the limit of 10 integrations. You'll need to upgrade your Slack account or disconnect another integration. Make sure that the "Send @mentions notifications?" field is set to "Yes." You must specify either a User Name or a Highlight Word for this zap to work. If you specify both, then both the user name and the highlight word will need to be included in a single message in order to trigger the zap. When testing message triggers, we only look for messages from humans (not apps or bots). Human users have profile information that you might want to map (while bot users don't), so we want that to be available in the editor. If Listen for Bots is true, then we'll trigger properly during actual runs. The format of the date/time stamp for this action is quite specific. It can be A Unix timestamp (up to five years from now), the number of seconds until the reminder (if within 24 hours), or a natural language description (Ex. "in 15 minutes," or "every Thursday").